The highest mountain range of Vietnam, Hoang Lien Son divides the Northwest Vietnam into two very different climate region which leads to a big different in plantation and landscapes. During three days of this trip you will explore both the two sides of this mountain range for its beauty of nature as well as observing daily life of different ethnic minority peoples for your discovery of their interesting culture and way of life. Please, be ready at your hotel lobby at 20.00 for a short transfer to Hanoi railways station. Tonight you will travel to Lao Cai on sleeping train in the most comfortable 4 bed cabin of Victoria compartment or in 2 bed deluxe cabin of other train carriage. 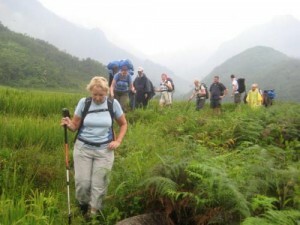 In middle afternoon, you Sapa guide will come to meet you again for a leisure walk around this charming town. Visiting Sapa market, you will see a lot of local farming products and spices for sale and meet many H’mong and Zao peoples in their colorful traditional dresses who come from nearby villages every day to the market selling their gatherings and hand made handicrafts… Continue walking uphill to Ham Rong mountain to visit a pretty orchid garden and then onto the top for breathtaking scenery of the town. The rest hour of the afternoon is at your leisure. Muong Hoa is a long valley lying between the Den Thang and Hoang Lien ranges of mountain on the south of Sapa town which is famous for its stunning landscapes and is home to the majority population of Sapa’s ethnic minority peoples including the Black H’mong, Zay, Red Zao. Leaving the Victoria after Breakfast, the road ride will take you southwards of Sapa along the only narrow road to Muong Hoa valley. Spectacular scenery of the highest part of Hoang Lien Range including Fansipan peak can be seen in the first 7km of the road trip with many photo stops. Then the valley suddenly opens wide as you reach to Lao Chai. From high elevation of the road you can see the whole valley, the Muong Hoa River winds its way through the valley bottom and small villages and hamlets of the H’mong and Zay peoples scattering on the other side of the river, even very high on hills slopes. Leaving the main road, you will take a walk following the foot path downhill and then crossing the river to the other side to pay visiting to Lao Chai village of the H’mong and Ta Van of the Zay during which you will drop in several local homes for experiencing their hospitability as well as observing the traditional living way. After Lunch at a beautiful village lodge, you will walk down to the river, swimming if you like and then take the road ride few kilometers further for the scenery of the waterfall before driving back to Sapa in the middle afternoon. Taking a shower and then transfer downhill to Lao Cai for taking the overnight train to Hanoi which arrives early next morning to end the trip. • Overnight train in Victoria carriage or in 2 bed deluxe cabin of other train carriage. • Return train tickets in 4 bed cabin of Victoria carriage or deluxe 2 bed cabin of other train carriage. • Accommodation: 2 nights in Superior room, Victoria Sa Pa Hotel.